Just a heads up that DevX just published an article of mine today. 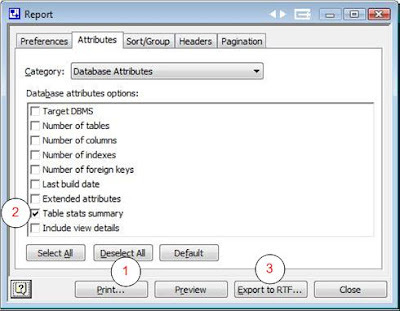 The article is entitled Sync Your Database to SharePoint Using SSIS. The article covers how to import and export SharePoint list items using Collaborative Application Markup Language (CAML), SharePoint's web services API, and SQL Server Integration Services. The latter half of the article is a fairly detailed how-to, but the former half covers what SharePoint lists are, what SSIS is, and why you would want to use them all together. I hope you find the article useful, and feel free to comment here if you have thoughts on the article. In my mind data models are like the foundations of a house. Whether you use ORM or a more traditional modeling tool, they form the base of the entire rest of your project. Consequently, every decision you make (or don’t make) regarding your data model during the design phase(s) of your project will significantly affect the duration of your project and the maintainability and performance of your application. You could de-emphasize up-front planning, but every correction you make to the data model once code has been written on top of it will introduce significant delays to the project as developers refactor data access, business logic, and user interface tiers. That’s why mistakes made during design are expensive, and it would behoove any architect (or project manager) to be well aware of the repercussions of data model decisions and minimize mistakes before construction begins. After years of working with or maintaining applications based on poorly designed data models, and after years of modeling my own databases from scratch I’ve seen and made a lot of mistakes. So, I’ve compiled ten of the most common ones and the arguments for and against them. I’ll be speaking on this topic in the upcoming IASA conference in October, and so I wanted to vet these ideas with the community. I know there are strong feelings on these topics, so please help me out by commenting if you feel I’ve missed something or am off base. I’ll start with Mistake #1: Not Using Referential Integrity in this post. I'll give four common reasons for avoiding referential integrity and then rebuff them. I'll then cover the more controversial Mistake #2 Not Using Surrogate Keys in my next post. If your project or database is only a few tables and a couple lines of code then you don’t need referential integrity right? Wrong, numerous projects start small, get big, and have major problems because of it. It doesn’t take much extra time to put in constraints. Avoid the urge to be lazy. Numerous applications I’ve seen forget a relationship or two. This is borne of writing and executing database creation statements by hand and is the reason that data modeling tools exist. When you visualize your database in a model it’s hard to miss a relationship. So use a modeling tool and keep it in sync with your database, you won’t regret it. Incidentally I like Microsoft Visio for data modeling because you can change your schema during development and Visio won’t delete your data. This enables you to keep your data model in sync with the database for the entire lifetime of the database. 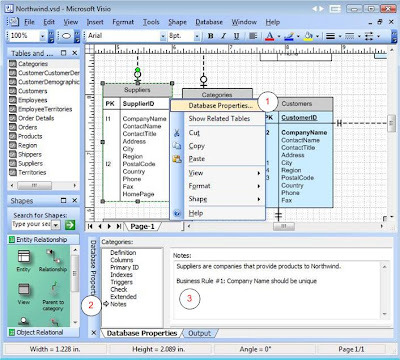 There are other benefits too, if you’re interested see my article on data modeling in Microsoft Visio. It’s a fact: indexes and constraints slow down insert and update operations. If your application is heavy on writing and light on reading, then you could argue referential integrity isn’t for you. This argument is often combined with the “Only one application ever uses my database” argument. There are two problems with this. One problem comes when either a well meaning DBA modifies data by hand and messes up the state of the database, or more realistically when there’s a bug in the application that accidentally orphans data. Orphaned data may not affect your application, but a well designed solution should plan for the future. When that data warehouse project finally gets around to importing data from your database, what do they do with the orphaned data? Ignore it? Try to integrate it? Who knows? If you’ve been in this position, you’ll know what I mean when I say the responsible architect’s name (or their app) will be synonymous with a curse word. The second problem is that even if a database without referential integrity don’t end up with orphaned data, a second application that might want to integrate can still never be 100% certain that foreign keys refer to existing records. It comes down to designing for the future. The answer to speed is to build your database with referential integrity, drop or disable your constraints and indexes before a bulk load, and re-enable them after the bulk load. It will increase the duration of your bulk load operation over not using constraints at all, but it will be much faster than leaving them enabled and checking them for each insert. So use referential integrity: the pros outweigh the cons. 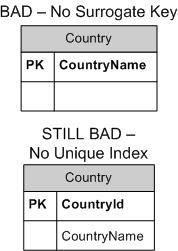 Too often I’ve seen databases with a foreign key that relates to one of five tables based on the value of a char(1) field. The space conserving mindset that comes up with this implementation is admirable, but it produces far too many negative side effects. What happens when the char(1) field gets out of sync with the foreign key field? What happens when someone deletes the foreign record or changes its primary key? More orphaned data happens. The solution is to use five fields that each refer to a single table. You may have more nullable fields that take up more space in the database, but it’s worth it in the long run. It seems like a dying art, but I still strongly feel that Entity Relationship Diagrams (ERD) should be the starting point of all software development projects. Since they are for me anyway, I wanted a place to refer colleagues to for how to read these diagrams, and an Entity Relationship Diagram Example seemed like a great place to start. Read the notation on the second entity (e.g. the crow’s feet with the O above it next to the Employee entity). If, as in the diagram above, the notation closest to the second entity is a crow’s feet with an O next to it, then the first entity can have zero, one, or many of the second entity. Consequently the diagram above would read: “A company can have zero, one, or many employees”. This is the most common relationship type, and consequently many people ignore the O. While you can consider the O optional, I consider it a best practice to be explicit to differentiate it from the less common one through many relationship. This is an interesting combination because it can’t (and for various reasons probably shouldn’t if it could) be enforced by a database. Thus, you will only see these in logical, but not a physical, data models. It is still useful to distinguish, but your application will need to enforce the relationship in business rules. This combination is the most common after zero through many, and so frequently people consider the second dash optional. In fact, some ignore both dashes, but I would highly recommend at least using one for clarity so as not to confuse the notation with “I’ll fill in the relationship details later”. The zero or one relationship is quite common and is frequently abbreviated with just an O (however it is most commonly seen in a many-to-many relationship rather than the one-to-one above, more on this later). A one-to-many (1N) is by far the most common relationship type. It consists of either a one through many or a zero through many notation on one side of a relationship and a one and only one or zero or one notation on the other. The relationship between Company and Employee in the example is a one-to-many relationship. The next most common relationship is a many-to-many (NM). It consists of a zero through many or one through many on both sides of a relationship. This construct only exists in logical data models because databases can’t implement the relationship directly. Physical data models implement a many-to-many relationship by using an associative (or link or resolving) table via two one-to-many relationships. Probably the least common and most misunderstood relationship is the one-to-one. It consists of a one and only one notation on one side of a relationship and a zero or one on the other. It warrants a discussion unto itself, but for now the Project to Technology Project relationship in the example is a one to one. Because these relationships are easy to mistake for traditional one-to-many relationships, I have taken to drawing a red dashed line around them. The red dashed line is not standard at all (although a colleague, Steve Dempsey uses a similar notation), but in my experience it can help eliminate confusion. I hope you’ve found this a useful example for deciphering and verifying entity relationship diagrams. As always please add any comments, disagreements, thoughts or related resources. 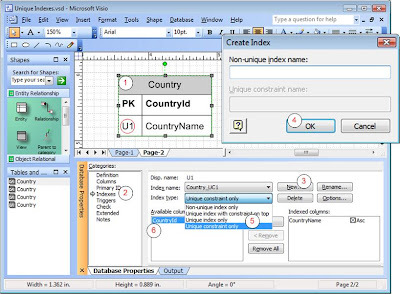 If you use the Enterprise Architect edition of Microsoft Visio for data modeling regularly, then there is a good chance that at some point you’ve wanted to export just the table names into Excel. You might want to do this to map logical ERD entities to physical data model tables, track project status by entity, or track overlap between database versions. Regardless, it turns out to be non-trivial to perform this export, particularly if you are unable to generate to a database to retrieve the table names. The trick is to use the reporting feature of Visio, but there are many reports and report options, and you will need one that is table-based to get the data into Excel easily. 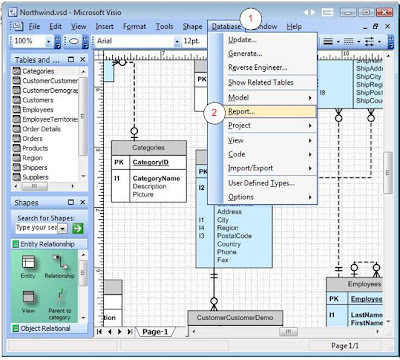 Note: If you are unfamiliar with the capabilities of Microsoft Visio as a data modeling tool you may wish to take a look at my Data Modeling in Microsoft Visio Tutorial. 1. This may seem a little unusual, but if you don't have any comments in any of your tables (which really shouldn’t be the case), you will need to add comments for at least one of your tables. 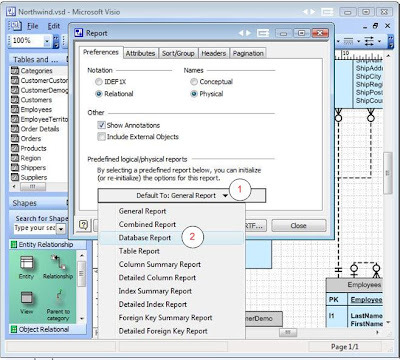 Without this step Visio will not display tables in a grid format in the report. 2. Now select the somewhat obscure "Report" item off of the "Database" menu. 3. 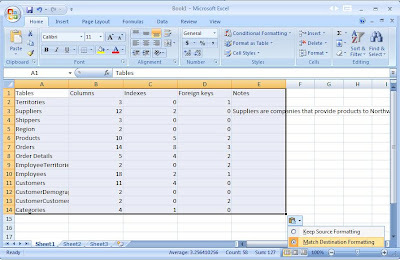 Only the "Table Report" provides the ability to layout database tables in a grid. Select it and click Finish. 4. 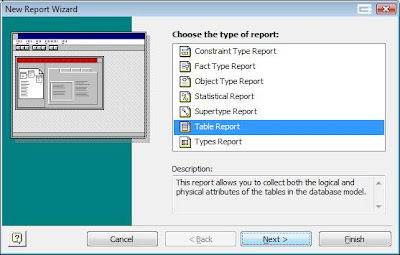 Under “Predefined logical/physical reports" Click the button labeled "Default To: General Report" and change it to "Default To: Database Report." 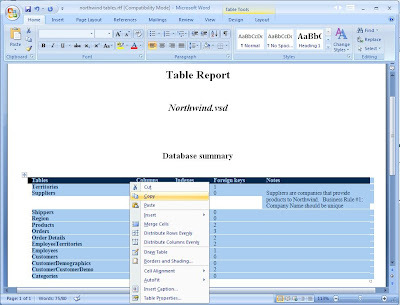 This will remove tables formatted per page from the end of the report. 5. Under the "Attributes" tab select “Deselect All” then select the “Table stats summary” option. 6. Click “Export to RTF,” save the file somewhere, and open it with Microsoft Word. 7. (optional) If you have any new lines in the notes field you may have to replace them with spaces. Just do a search and replace for "^l" and replace with " ". 8. Now you’re ready to copy and paste. And you’re done! Hopefully this tutorial will make life easier for you next time you need to export table names from Visio to Microsoft Excel. All three features are purely syntactic sugar: they add nothing of real value to the language (unlike generics in C# 2.0 for example). One feature is wonderful, while two are terrible. Hmmm, and by the way did you count the number of lines? So do the differences between my thoughts on automatic properties contradict with my thoughts on object initializers and collection initializers? They don’t. Basically a little sugar is good, but too much ruins the dish. 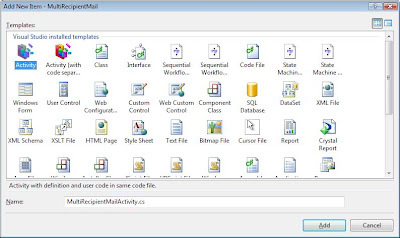 In the previous post in this series (Multi-Value Columns in SharePoint Designer - Solution #1), I described a problem where SharePoint Designer can’t send e-mail to multiple recipients if those recipients exist inside of a multi-value column in a SharePoint list. The simple hacky solution I described was to temporarily turn the column into a single value column just for SharePoint Designer. But this approach has problems, and there is a better way: developing custom activities in Visual Studio for use in SharePoint Designer. In this post I will describe how to develop a custom activity in Visual Studio that will also solve this problem and I will also describe how to install it on a SharePoint server so that SharePoint Designer clients can automatically download and use it. Before I do let me back up and tell you why, from my perspective, this approach is probably not the best way to go. SharePoint Designer is a Microsoft Office product that replaces FrontPage, integrates tightly with SharePoint, and allows non-developers (aka “knowledge workers” in the Microsoft lingo) to create simple workflows without writing any code. The problem is that simple workflows and multi-value columns are like oil and water: not so compatible. If you’re using multi-value columns then your knowledge workers should admit defeat and let developers create the workflows in Visual Studio using the Windows Workflow Foundation (which, incidentally, will be the topic for third article in this series). Still, you may have a good reason for continuing to develop workflows in SharePoint Designer, and I’ve already gone through the pain of writing and installing custom activities, so hopefully this post will make life easier for someone somewhere. The code to create the custom activity in Visual Studio is the most interesting part of this solution. Make sure to check out the GetEmailAddressesFromUsernames() method if you have time to review the code. Here is the procedure assuming this is your first time working with Windows Workflow Foundation in Visual Studio. 1. The first step is to download and install Visual Studio 2005 extensions for .NET Framework 3.0 (Windows Workflow Foundation) which will add workflow options to Visual Studio. You should install these to the Global Assembly Cache (GAC) to make Visual Studio happier, although you may still need to reference them for your project. The easy way to install to the GAC is just to copy them to somewhere on your local (non-W2K3) machine and then drag them all over to C:\Windows\assembly. 3. 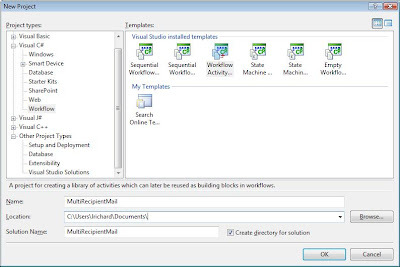 After completing step #1 when you open Visual Studio you should get a new tree node under “Visual C#” (or Visual Basic) called “Workflow.” Select that, then “Workflow Activity Library” then call the project something like “MultiRecipientMail”. 4. Visual Studio should automatically create a blank activity called Activity1.cs. If you want a more reasonable name then delete it and “Add” a “New Item” of type “Activity” called something like “MultiRecipientMailActivity.” Don’t make the same painful mistake as me: name your activity something other than the name of the project or anything in the namespace. 5. At this point you could drag and drop a “Replicator” activity on the design surface and put a “Send Mail” activity inside, but I’ll cover that in my next post. For now I think code is the clearer way to go. Hit F7 or right click and “View Code” and paste the following which I’ll try to comment in-line rather than in this article. // Windows Workflow Foundation (WWF) will store the workflow state using these "instance property"
// I looked for a while to find an easier way to get e-mail addresses from user names, but no luck. Perhaps web services. // delegate, so the anonymous delegate works. This will probably fail if the user has no WorkEmail, but it's a starting point. /// with appropriate for debugging. In production it should log to the event log or be removed. If you’re new to .Net 3.0 you’ll find the whole dependency property thing pretty confusing. I’ll write about it in another post. For now just think of it as a big weakly typed hash table whose values WWF can use without prior knowledge of their existence. 6. To get this to compile you’ll need to add a reference to “Microsoft.SharePoint” and “Microsoft.Office.Server.” If you’re on a non-W2K3 machine you may need to reference the DLL’s manually that you copied from step 2. Regardless, double check you can compile (Control+Shift+B or Build->Build MultiRecipientMail). To give credit up front, a large part of this procedure came from Todd Baginski’s Blog. However, I still had a lot of difficulties, and based on the comments on the Microsoft forums regarding the multi-value column problem, a refinement of Todd Baginski’s work from a different perspective will be valuable to the MOSS community. In any event everything regarding this multi-value column solution is now in one place. 3. 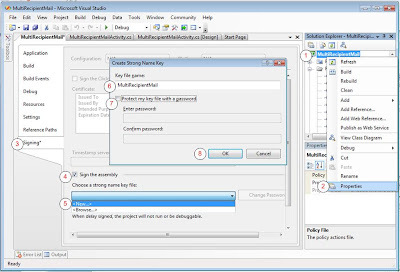 Type “sn -T MultiRecipientMail.dll” and copy and paste the public key token by right clicking and selecting mark then hitting Control-C. Save this token for later perhaps in notepad or commented out in your AssemblyInfo.cs file. The latter is the correct way and works in a deployment script, but I’d opt for the former for convenience. You’ll need to substitute your own public key token from step 9 in the “Assembly=” statement. 13. Restart IIS by opening a command prompt and typing “iisreset.” SharePoint will pick up the new MultiRecipientMail.ACTIONS file, find the dll in the GAC, and provide the new information to any SharePoint Designer clients that access the site. 15. If everything worked correctly you should now be able to 1. click Actions; 2. More Actions; 3. Select the “Custom Actions” category from the dropdown (this category came from the .ACTIONS file in Step 11); and 4. Select the “Multi Recipient E-mail” action. If it doesn’t show up in the Workflow Designer page after clicking "add", then you probably referenced it incorrectly in the Web.Config. 16. Now you should be able to 1. click the Fx button next to “To;” 2. Select your multi value column (e.g. Peers To Review from my previous article); 3. Hit Ok; and 4. Fill in the remaining fields with values. 17. 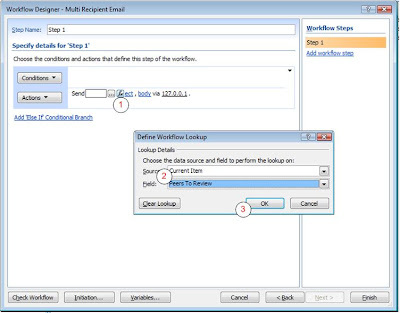 Now if you head back to Sharepoint, select the dropdown of a list item in the list associated with your workflow, click “Workflows”, select the workflow you created in SharePoint Designer, and click “Start” you should receive an e-mail at each address in your multi-value column. Well … at least it worked for me. :) I did kitchen test this article, but please leave comments if it doesn't work for you. 3. Re-install the dll to the GAC. You can just re-copy it over to c:\windows\assembly if you like. 5. Finally, if you need to make changes to your workflow, you may need to restart SharePoint Designer to download the new dll (I usually have to). 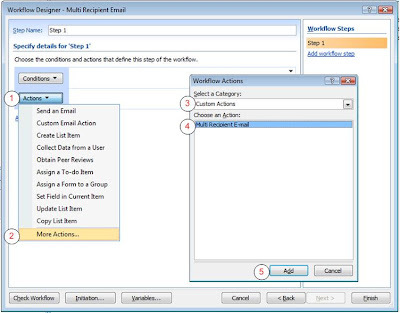 So you should now have a reusable component that non-developers can use in SharePoint Designer to send e-mail to multiple recipients as determined by a multi-value column in a SharePoint list. Of course if you decide that developing the workflow in Visual Studio is better, then the third article in this series may be for you.